What is a Classified Area & Why is it Hazardous? National Electric Code: The 2017 edition of the National Electrical Code (NEC) devotes 13 Articles spread over more than 69 pages to Hazardous Classified Locations. This constitutes more than ½ of the requirements for Special Occupancies, and nearly 10% of the requirements contained within the entire NEC. So, what is a Classified Area? Classified Areas: Installations are “Classified” hazardous because of the presence, or the potential presence, of a flammable or combustible “material”. This material can be either gas/vapor, dust, or fiber/flyings. While each type of material has unique hazardous events to consider, they all present a risk of explosion. An explosion can directly cause several types of hazards including fire and the expelled energy. An explosion can also indirectly lead to additional hazards such as injury from flying shrapnel or the shockwave itself. Explosion Triangle: The basic elements needed to cause an explosion are found in a diagram commonly referred to as the “explosion triangle”. 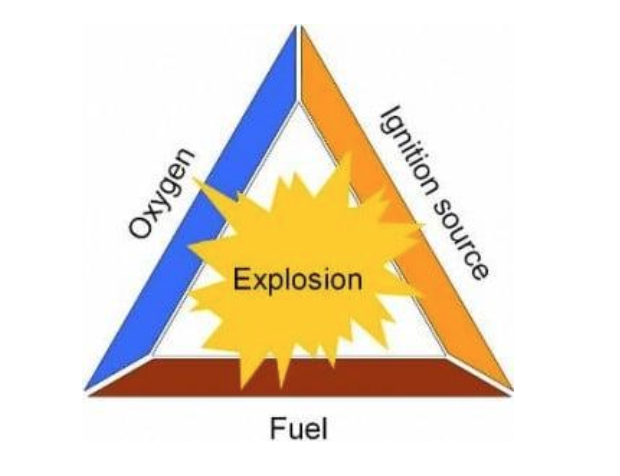 All 3 elements of the triangle must be present to achieve an explosion. Fuel: The “fuel” is the flammable or combustible material that is the basis for classifying the area as hazardous. The fuel must be available in a quantity sufficient enough to cause an ignition. Oxygen: The amount of oxygen present is normally only what is available as part of ambient air (21% Oxygen at ambient pressure). Ignition Source: The ignition source is any source of energy which can cause combustion when the fuel is mixed with an oxidizer. For this discussion, we will consider ignition initiated by a spark or hot surface generated from electrical equipment. Other ignition sources require special considerations. Preventing an Explosion: If any one of the legs of the explosion triangle is removed, an explosion is not possible. Which means that to prevent an explosion, at least one leg of the explosion triangle has to be eliminated. The preferred method depends on the application. However, most protection techniques are based on removing the ignition source. Prevent the fuel from being present in the area. This can be accomplished proactively by site planning or by using a protected electrical enclosure to prevent the fuel from entering the enclosure (ex. Purge or Pressurized enclosure). Prevent the fuel from concentrating to an ignitable mixture with air. This can be accomplished by ventilation which removes the fuel/air atmosphere in the room and replenishes with fresh air. The ventilation air flow has to be at a higher rate than that of the fuel source so as to dilute the area. Replace the air with inert gas (ex. Nitrogen). The gas has to be inert because it must be non-reactive. There is a very obvious downside to removing the oxygen leg, NO PERSONNEL CAN WORK INSIDE THIS ENVIRONMENT. Even if only individual electrical enclosures are purged with inert gas, the potential to dilute the oxygen concentration in the surrounding room either by normal leakage or by rupture must be considered and protected against. Spark Ignition: Spark ignition is the result of electrical energy that is stored within the equipment being released as a spark/arc during a make/break event (ex. switching of a contactor). The spark energy can also be released during a single fault event (ex. rupture of a fuse, breakage of wiring, etc.). The spark ignition source can be removed by eliminating all make/break events and/or limiting the energy of any make/break event below the minimum ignition energy specification for the fuel source. Thermal Ignition: Thermal ignition is the result of hot surfaces causing an increase in the temperature of the fuel/air mixture to a point that the fuel spontaneously combusts. Temperatures must be limited during both normal operation and abnormal operation conditions. Conclusion: On paper, removing the explosion hazard is as simple as removing one leg of the triangle. However, in the real world, this is not so easy to accomplish. For example, removing the fuel leg is typically accomplished by using other electrical equipment. However, this adds electrical equipment in the hazardous classified area that must also comply with the hazardous equipment requirements. And the added equipment can’t protect itself during start-up conditions, so it must be protected by removing a separate leg of the explosion triangle locally. And things don’t always go according to plan. Moving parts wear out, seals leak, human error is inevitable. We can’t design for safety without considering reliability, expected wear, failure modes and the need for redundant or fail-safe features – topics which we will discuss in future whitepapers.